April | 2015 | Discovered ... Right Here! Life is an Adventure – Let's Go! Summer is coming! Just over a month away. Now, I really do enjoy exploring the Pacific Northwest in the springtime because of the mild weather, even if it often does include rain. Nevertheless I am looking toward summer adventuring. This summer I want to go hike up around Horsethief Lake. Horsethief Lake Park or Columbia Hills State Park is a Washington State Park, located across the Columbia River a few miles from the Dalles, I believe. I say, “I believe” because I have not been there yet. I first learned about Horsethief Lake while browsing through travel books in the gift section at a New Seasons Market last spring. Unfortunately I don’t remember the title; sure wish I did. I seem to remember it described the location in the Gorge and the short moderate hike with decent views of the Columbia from Horsethief Butte. What caught my attention was its description of the lake and its swimming spot. I seriously like the idea of a warm summer hike if it has the option of cooling down at the end! From my investigation, I learned that there is also camping, Indian artwork (pictographs & petroglyphs) tours and risk of bullsnake and rattlesnake encounters at this Park. Doing this hike has been something I’ve been thinking about and wanting to do for over a year. All of last summer I kept making tentative plans for my few summer days off from work. Here on this blog I really haven’t posted about future plans before. Even so I’m writing this post because I face a couple of challenges. My big challenge is the distance. At almost two hours and 97 miles one way, it’s a bit of a drive. Is it worth it? I don’t know. If I’m going to drive that far, for a day hike or an overnight stay, I would like friends to come along. My smaller challenge is that sometimes, even with the gamest most enthusiastic friends, you have to sell the adventure, and I don’t feel that I have much with which to entice. Each source I find gives only a small amount of information. Is it not very popular or is it just not talked about a lot? Maybe it’s a hidden gem and worth a visit? I’m curious and hope to find out this coming summer. What adventures are you planning for in the future? How are you addressing whatever challenges might be holding you back? After stopping at Crown Point (you can read about it in the last post), one of the scenic spots along the Corbett to John B. Yeon State Scenic Corridor, my friends and I kept traveling along Highway 30 toward The Dalles. While traveling along the Scenic Corridor you pass a number of waterfalls, all of them impressive. 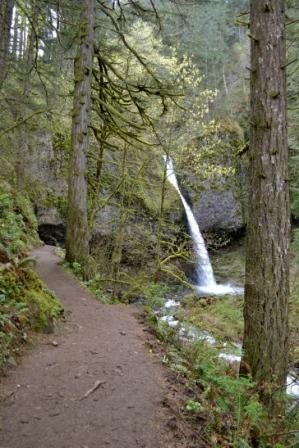 One of them is the well-known and frequently visited Multnomah Falls, but the others, while not as well-known or as high, are still sensational. Of the eight noted on the map of the Historic Columbia River Highway, most are quite visible from the road. Now I have bragged about my great state of Oregon before, and here I go again. 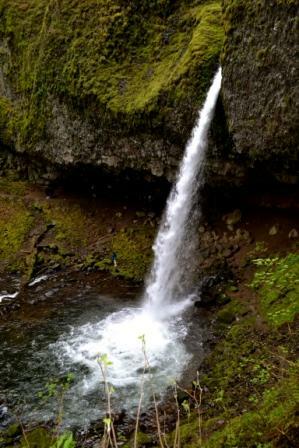 According to the experts in the State Parks department, “The Columbia Gorge presents the greatest concentration of high waterfalls in North America.” How cool is that? On this trip we decided to stop at Horsetail Falls. As it is easily seen from the road, we merely pulled to the shoulder, hopped out and began snapping photos. While looking at information signs we learned that with a short half mile hike along Horsetail Falls Trail we could take in the upper Horsetail Fall, as known as Ponytail Falls, as well. Those of us game for a short hike up a moderately steep path decided to go for it. It was worth it! 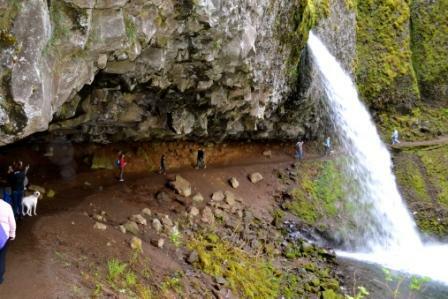 The hike begins at the lower part of Horsetail Falls. Staying right straight on the rock, the water falls off lower Horsetail Fall in a quintessential “horsetail” fashion, creating a wide misty spray as it enters the pool below. This type of flow is called a “horsetail” because it “spreads out to resemble a horse’s tail while maintaining some contact with the underlying bedrock surface,” according to the lovely and informative signs put out by the helpful and knowledgeable State Forest Service staff. There is a coble-stoned viewing area where you can take in it, complete with the roar in your ears and the mist on your face. The trail meanders up and through the forest, poison oak, ferns, rocks and wild flowers. Made of mostly compacted dirt and gravel, it rises and winds along with gorgeous views of the Gorge. 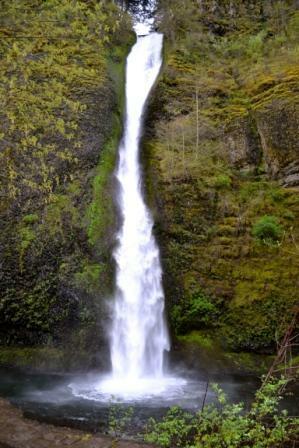 Then around one bend, you suddenly see the upper portion of Horsetail Falls – Ponytail Falls. 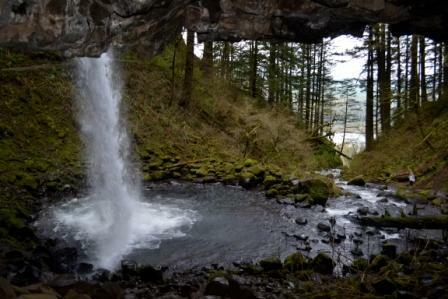 As a “plunge” type waterfall, which as the type name indicates, the water plunges over a rock cliff into a rocky pool before flowing down as a short river and falling as the lower portion. The trial leads under the rock cliff and onto other falls. We made this a destination hike, and after admiring the upper portion, proceeded to hike back down the way we came. Everyone said that Easter Sunday would be rainy here in this corner of Oregon. (Yes, it did rain, didn’t it? But not until the late afternoon though!) Despite the forecasted gloom, my friends and I went to watch the sunrise by the Vista House at Crown Point in the Columbia River Gorge. 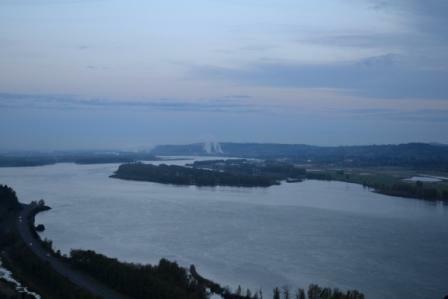 Leaving Portland bright and early (before dawn!) 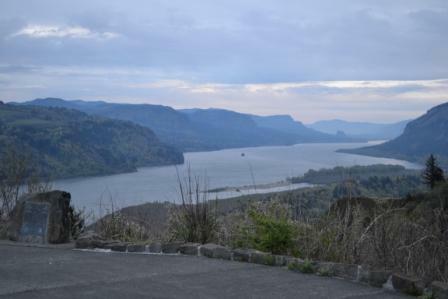 we drove out to old Highway 30, the Historic Columbia River Highway. Taking exit 22 off Highway 84 to Corbett, we picked up 30 and headed northeast along the State Scenic Corridor, driving above and parallel to 84 and the Columbia River. Somehow I thought we would be alone up at Crown Point at sunrise (7:09 a.m.), but others were already parked there when we arrived. One man had a tripod and camera set up, and out of another car a guy would hop out into the cold to quickly take a few photos or a panorama before hopping back in the car where he and a gal would just sit for awhile. During our time there, several other cars came by. Some people paused awhile and ventured to briskly amble along the walkway, while others slowly cruised by and then sped off. The view is worth the stop. For simply miles you can see up and down the river. While the cloud cover prevented us from actually seeing the sun appear over the horizon, it was beautiful to see the Gorge awake and the daylight emerge. Birds chirped, blossomed trees swayed and the moon shone bright in the west. My fingers, despite my gloves, froze, loose hair and clothes whipped in the breeze, and all the while my eyes savored the views and teared up with every cold gust. As the sky slowly lightened, the little lights of towns and dwellings along the river faded along with what earlier were bright pricks of light speeding below along 84. From one of the information signs I learned, “Samuel C. Lancaster, the design engineer of the Historic Columbia River Highway, envisioned this outcropping as the ideal site for a rest stop and observatory where the Gorge ‘could be viewed in silent communion with the infinite’.” As I was there contemplating the rising of the sun (along with the Easter risen Son aspect), I felt that his vision was satisfied. 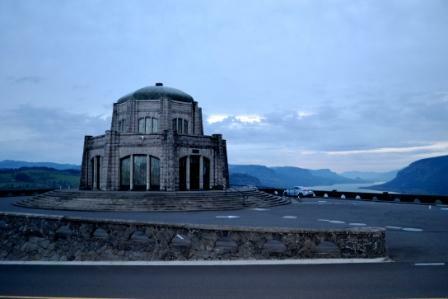 Up at Crown Point the visitor’s center, the Vista House, sits as the “Jewel on the Crown”. A lovely stone building, almost 100 years old (built in 1917), it sat majestic and closed while we were there. Next time we visit Crown Point we might be there during visitor hours.